As expected, winter (as we know it, anyways) returned to the southland as of late. Cool temps, rain, wind, and a splattering of snow on the foothills and mountains made that abundantly clear. But as Detroit-based blogger Patti Abbott noted in her SoCal vacation summary (which coincided with our recent warm spell), “You know you’ve been in California too long when you see Chris Matthews on TV and wonder why the hell he is wearing a wool jacket.” That would about cover it. A brief synopsis of the film: In 1948 Los Angeles, a recently unemployed African-American World War II vet is searching for work. Ezekial Rawlins, ‘Easy’ to his friends, needs the job since he’s a home owner and there are bills to pay. Wanting to keep his tenuous perch in the middle class, he’s open to whatever comes his way. Even if it means accepting something from a furtive white stranger by the name of DeWitt Albright. The undertaking involves locating the fiancée to a certain well-to-do man… in other words, one of the city’s elite. Since she’s known to frequent the Central Avenue Black jazz clubs of the era, DeWitt surmises Easy is the right man for the job because he can move in circles and ask questions he cannot. And by innocently accepting the offer, Easy Rawlins will become involved with crooked cops and politicians, murder, and the nasty side of human corruption. My Review: First, let’s get my bias out-of-the-way. 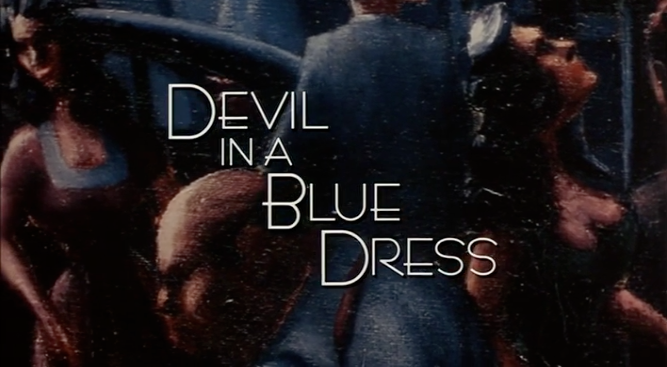 The 1995 adaptation of Devil in a Blue Dress remains a favorite of mine on many levels. And Carl Franklin is major part of that as he not only directed it, but performed the screen adaptation from the novel he held in high regard. Plus, the source novel by Walter Mosley itself struck its own chord of relevance in crime fiction with its distinct perspective that spoke to many of the disenfranchised when it first appeared back in 1990. The book (and the film) presented the ugly racial reality as it told its late-40s mystery and presented a much different backdrop to the beautiful Los Angeles “…they were sellin’” (to paraphrase James Ellroy). Even with the changes Franklin made to the original story for filming, it didn’t amend that essential viewpoint. In all honestly, the peaks at social realism which was part of the background in such well-known crime classics of L.A. like Chinatown and L.A. Confidential (also top picks of mine), is very much front stage in Devil in a Blue Dress by comparison. It is no question that is its strength and weight, I think. Like the neo noir classics I’ve mentioned, this film captures and holds the City of Angels in another time and it becomes an additional character in the picture’s narrative. This isn’t the pre-war city of Roman Polanski’s Chinatown where the behind the scenes brokers were beginning to flex their power, nor it is the same place struggling to throw off the corruption of its police force years later during the 50s as was on display in Curtis Hanson’s L.A. Confidential. No, this was Los Angeles’ post-World War II era. The period recognized for its influx of out-of-state migrants1, and it’s reflected with clarity in the film. All of the out-of-towners were treated as outsiders (especially when they competed for the same local jobs), and for clear reasons other than just where they came from. It is that status the former Houston, Texas native Easy Rawlins (Denzel Washington in a role tailor-made for him) is well aware of. Easy: [to himself] Nervous? Here I was in the middle of the night, in a white neighborhood, with a white woman in my car. No, I wasn’t nervous. I was stupid. DiaBD is neo noir in the best sense, IMO. Director Franklin plays with the conventions of this crime genre, but to his credit never really tries to break from them. And in this case, the hero, while being cynical (à la Chandler’s Philip Marlowe) with regards to people and the cards dealt him as a black man in 1948 society, he is also the innocent neophyte in the story (as Franklin notes in the commentary track on the DVD). He’s not, nor does he resemble, the hardboiled detectives of my parent’s time. Not by a long shot. “Easy” is not even a P.I. at the start of this introductory story. And he stumbles more than once in his attempts at locating the wayward bride-to-be, the mysterious Daphne Monet (played with particular understated grace by Jennifer Beals). So much so, he needs the intervention of childhood friend Raymond ‘Mouse’ Alexander to save him. Don Cheadle is extraordinary as the friend from hell that rescues our hero — he and Joe Pesci (Goodfellas, Casino) should give lessons for how a small guy can throw the fear of God into anyone. He’s menacing like few others, and a standout in a cast loaded with a number of skilled actors. 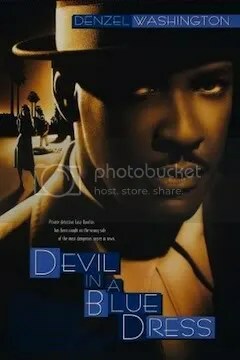 Devil in a Blue Dress has always been an underrated piece, but nonetheless one of the definitive ‘L.A.’ films, in my humble opinion. Carl Franklin deserves considerable praise for managing to capture a glimpse of an era and an area long kept in the shadows of LaLa Land as he transformed Mosley’s story to the screen. The Central Avenue he arrayed in the film’s backdrop, the vibrant African-American community steeped in its jazz roots, was lovingly accomplished, I believe. The classic jazz and Shout & Jump (the style/sound that foreshadowed Rock ‘n Roll) music cues used by Franklin throughout the picture genuinely established the period and locale2. As well, the noted Tak Fujimoto served as DP in the film and delivered a visually beautiful film that honored noir tradition while setting the distinct mood characteristic of this undervalued filmmaker. The use of widely known and uncommon locations (unless you’ve been there) in Los Angeles for this period film was impressive, and very much appreciated by fans of the film and those who live here. The construction of the movie made clear the hopes of the filmmakers for continuing Easy Rawlins as a series (plus, there were many books and short stories by the author to gleam from). However, its overall box office under-performed and any plans were discarded to cinema’s waste heap, unfortunately. Fittingly, I’ll close this review with the scene that continues to have an effect on this L.A. dweller — almost as much the “Forget it, Jake. It’s Chinatown.” finale from that definitive film. It is an appropriate one, too, though considerably amended from the novel’s. Not only does it lay out the secret of the Daphne Monet character, but I believe it works remarkably well because of the singular quiet performance by Jennifer Beals in the scene. She really brings a heartfelt and sympathetic power to the sequence. You’ll note she barely has any lines here. Still, the actress really makes the most of it with just facial expression and body language throughout (helped enormously by Franklin’s selection of location and framing, Fujimoto’s camera work, and Elmer Bernstein’s touching theme). As good as Denzel Washington is in this, Beals is the reason the excerpt resonates after all these years. Trivia: note the misspelling of Shoo-in in the headline when this scene ends on the fade-in to the shot of the newspaper. The goof is acknowledged by Carl Franklin in his commentary as something he missed in the film’s production. Book club ran late today so I can’t give this awesome review its due right at this moment. Have many questions and comments (I love so many of the points you bring up) but will be back tomorrow with them and a response over at my post. More soon! Great review! So many productions details of which I was unaware. I always enjoy those! Perfect clips to illustrate the heart of the film, too. As I was reading the book my husband asked me if I saw Denzel Washington in the role. The answer was ‘at first.’ You see, I find that the theme and backdrop of the book and film are quite similar but they begin to take on very distinct personalities as you get into them. At the end of the book I didn’t see anyone in the movie any longer. They were so vibrant in the book that they took over the on-screen depictions. That being said, I like the book and movie and the story but it’s almost like there are two stories for me, being similar but distinct as well. One major change in the film, for me, was how much more polished everything was. Everyone felt very raw in the book. Just a little more violent, a little more desperate, a little more indecisive, a little more vulnerable. I missed that in the movie. Even Daphne’s character, who you probably remember I complained about in the book, was much too smoothed out for what I would have preferred. I didn’t care that I didn’t like her much in the book but I would have liked her to be more interesting for me. Rather than doing that in the film, she was simply made to be more likable. Not a decision that I am too upset about just one that didn’t go in the direction I would have preferred. What did you think of Washington’s portrayal of Easy compared to how you imagine him from the book? Do you have two distinct impressions like me or do you find that they meld together well? How did Book Daphne and Film Daphne make out with you? Do you like one better than the other or feel that they both represent an interesting life that became the center point for Easy finding his feet in L.A. and as a PI? Excellent point re: the book and its adaptation. I, too, see them as having the same viewpoint, but a discernibly different vibe. Your phrasing of it feeling “very raw in the book” is an apt one. I wonder if it’s related to the fact that it was being presented visually to the audience (for the first time) and the desire of filmmakers to make it exciting (and attractive) to them that imparted that? 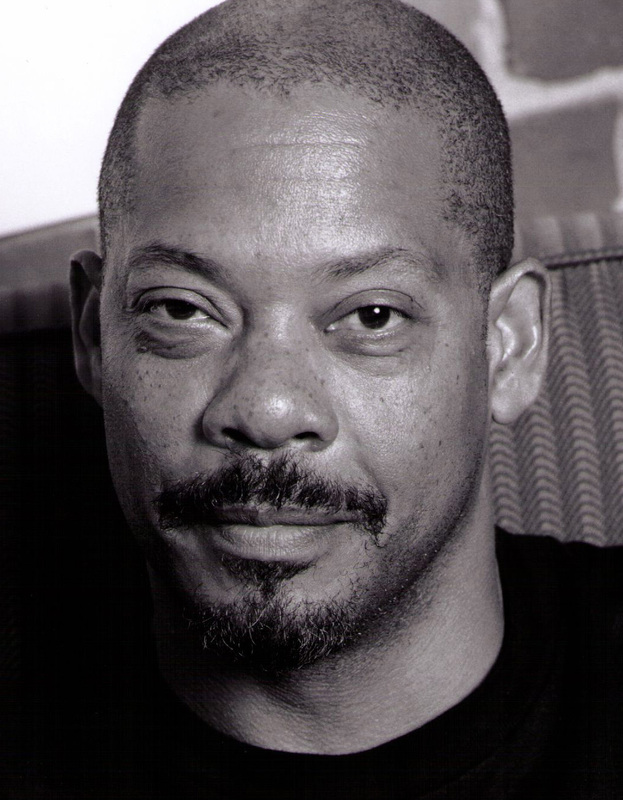 The other influence may be Carl Franklin’s familiarity with the character of Easy Rawlins by way of the series as a whole, and the aspiration to produce future films. Likewise, the other big difference is that of Daphne Monet. In Mosley’s novel, the reader gets the title. Here, it’s harder to discern. She’s more sympathetic in the film, and perhaps is meant to be more symbolic. Segregation and discrimination (and the use of passing as a by-product of overcoming the color-line) is at the heart of the mystery story presented. It, in my mind, certainly added to the poignancy of the film’s conclusion. Franklin’s says (on his commentary track) they filmed the sexual get together scene between Daphne and Easy from the book, but decided to cut it from the film. I think the empathy he sought for the character would have been undermined. I liked Denzel’s portrayal of Easy, but you’re right that he smooths over the character’s harder edges. But, in the series those edges do become more refined over time (fatherhood, for one), I think. But he can still do or ignore things that you know will cause him grief long term (something I find in the Jack Taylor series). I guess I’m of the mind of appreciating both the Easy & Daphne of the novel and the film because they work best in their separate mediums. How about you? Do you think Film Daphne would have worked with Book Easy, or vice versa? Ooh, interesting question. Since I see the two pairs so separately I hadn’t thought of mixing them up. Hmmm, I think movie Easy would have been eaten alive by book Daphne and that book Easy would probably have been a little less intense with movie Daphne. Even if Easy keeps it internal he has very strong reactions to things. He was particularly affected by Daphne and the quieter force of her nature, in the movie, would probably have tempered some of book Easy’s behavior. Excellent! I fully agree with your thoughts on this. Thanks, Rachel. This is an amazing review/post. So thorough. Now I need to go back and watch the movie again. Thank you very much, Naomi. If the post got you to want to re-watch the film, then I’ll definitely count it as a feather in my cap :-). I absolutely appreciated your comments on this very underrated movie. I am really disappointed that there will not be more Easy movies as I have devoured the series. I am afraid the movie was made too early, sadly I don’t believe mainstream was prepared to appreciate an African-American male,who is strong, intelligent and not a prisoner to vices. I hope some day the studios will give this incredible book series another chance,. Welcome, my friend. I’m with you, Diana. Walter Mosley’s Easy Rawlins series is well worth more film adaptations — so, too, is his Leonid McGill series (which I’m enjoying very much at the moment). Thank you very much for your kind words and comment. Another superb review Michael. I too feel that this is very underrated. I’m a big fan of American crime fiction. Particularly the ones from this era. Mosley and James Ellroy have done some marvellous stuff but it’s just a shame that most film adaptations dont do them justice. This is an absolute cracker and Ellroy’s only real classic is Curtis Hanson’s L.A. confidential. Two great film’s from two great writers. I long for more. Thanks for reading and going back in the archive to find this review, Mark. We seem to have a lot of things in common. Crime fiction is something I’ve gravitated too in later years, and I’m so glad I have. Yes, Mosley and Ellroy have written some stellar novels. I agree they’ve not seen more of their superb work adapted (and adapted well) to the big screen. Tell me, are you a fan of your countryman, Russell D. McLean? He’s a crime writer, and a film fan, I met last year at the mystery writers convention, Bouchercon. I’m trying to squeeze his ‘Lost Sister’ novel into my far too big TBR stack. Yeah, we seem to enjoy a lot of similar stuff Michael. I’m so glad Ruth encouraged me to stop by, you have an excellent blog going on. I haven’t heard of Russel McLean before but I’ll be checking his stuff out now. I’ve recently started on Norwegian writer Jo Nesbo’s crime novels after seeing the brilliant “Headhunters” and the likes of Scorsese picking up one of his books for an adaptation also. Thank you very much. My book friends keep telling me to give Joe Nesbo a read (and I’m looking forward to ‘Headhunters’, but it won’t come available for rent till the 28th of the month). Awesome post! I really need to see this one, sounds like a great, atmospheric neo noir and it’s got Denzel on top form, what’s not to like? Thanks Michael! Thank you very kindly, Ruth. Yeah, I do have a warm spot for this neo noir by Carl Franklin. I hope you do check this one out. Stop back when you do, or post your own review about the movie. I’d love to hear your thoughts of it. Great post I am agree with Ruth’s view. I actually have a question. What was the difference between the relationship of Daphne Monet and Easy Rawlins in the book and movie? Welcome, jay101. Refer to my reply to sgwordy’s comment back when this was published. Easy does become intimately involved with Daphne in the novel. I’ve heard that was lensed by the filmmaker but edited out of the final theatrical cut. Thanks for the read and comment.